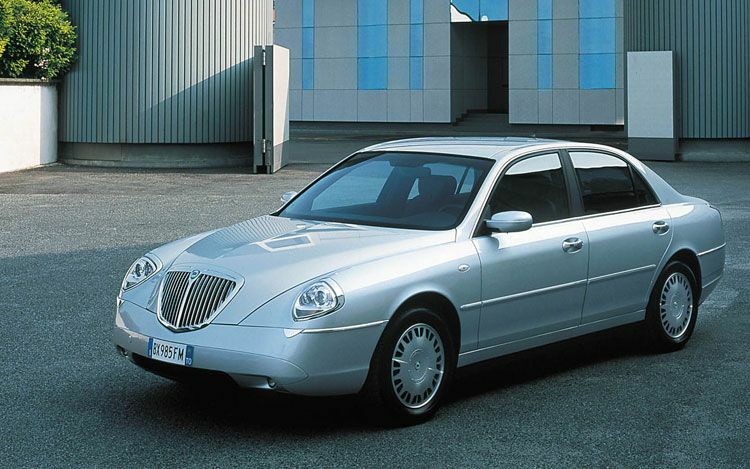 The 1998 Dialogos concept previewed the full-sized Lancia’s final fling. During 1996, Lancia began work on a new large car concept. Lancia design director, Mike Robinson was briefed to create a car that would honour marque traditions, while also being a showcase for upcoming in-car technology being developed by Fiat at the time. The concept was also intended to preview the next generation full-sized Lancia saloon style. Robinson began with something futuristic and rather Citroen-esque before changing tack significantly to something far more nostalgic. In this he was not alone; in fact, most of the industry was in the process of raiding their back catalogues in what appeared in retrospect to be rather a frantic search for meaning during those immediate pre-millennial years. Therefore the 1998 Dialogos leaned heavily upon the style of the fabled Aurelia models – especially the Pininfarina Gran Turismo derivative. This could be seen in the deep shield grille flanking a pair of single headlight units, defined front wings flowing back into the sculpted flanks and a softly sloping tail, featuring delicate blade-like tail-light units. The lack of a centre pillar and reverse opening rear doors also echoed the Aurelia Berlina and Pininfarina’s 1955 Florida concept, allowing the concept’s open-plan interior centre stage. Lancia’s press release of the time stated: “The car’s impressive dimensions are lightened by uncluttered profiles and seductive curves… the gaze is free to wander beyond the normal boundaries, inside and outside the car.” For its time, the Dialogos was a voluptuous, well proportioned shape, even if, viewed through the lens of 2014, it aptly illustrates the pointlessness of retro. Form-wise, it possessed echoes of Moray Callum’s equally elegant Vignale Lagonda concept of 1993 in its determined advocacy of past values. 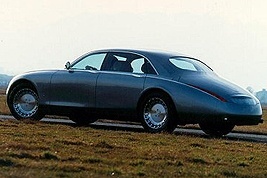 Unlike the Lagonda concept however, the Dialogos did spawn a production car – the 2002 Thesis. This model has been adequately documented on these pages to require much in the way of further elaboration. Well, perhaps a little, because looking again at the Dialogos, one can’t help thinking the biggest error the car’s designers made was to refer back to Lancia’s past at all. Throughout the marque’s heritage, Lancias have always been forward looking, but with this concept, they effectively entombed Lancia’s design heritage and by doing so, inadvertently created its cenotaph. The resultant production car retained a number of the concept’s visual features, but the transition from concept to production saw too much of the essential removed for the end result to be credible. The Thesis’ silhouette was overly upright and truncated, leaving the forms and surfaces incapable of supporting the show car flourishes. The resultant incongruous appearance probably did more to hamper sales than any perceived slur against the Lancia brand itself, despite the fact that there seemed little wrong with the Thesis’ fitness for purpose. As an aside, Robinson told Car Design News earlier this year that the Thesis remains his favourite design over a 22-year career at Centro Stile Fiat. Following his departure in 2009, he subsequently assumed a similar role at Bertone, being responsible for, amongst others, the wilfully retro B99 Jaguar concept – suggesting his dialogue remains firmly with the past. I saw the B99 Jaguar (in racing colours for some reason) at the Milan Museum. Since there was surely no chance of Bertone getting a commission from Jaguar it seemed double pointless. As for this, in its pure Dialogos form, it would have made a better S-Type. And Robinson’s original sketches would have made a better Citroen C5 or C6 … or Lancia Thesis. As I said elsewhere, Lancia ought to have delivered strikingly modern styling and comfort-orientated handling. The striking modernity would confound people who thought comfort meant cars for the conservative. And Alfa could be left to offer conventionally “aggressive” and “sporty” looks served up with a suitably firm ride. That would be the car for conventional people who also like BMW, for example. The Citroenesque quality of the sketches indicates that Robinson was thrashing around and then landed on the idea of retro-classisicm. I do happen to still like the Thesis and overall, it is a special car. The poor old Lagonda has an archaic architecture with dated 90s show-car details glued on top of it. I am glad they did it though, so we can see that some ideas don´t work anymore. I loved reading this again. The Dialogos was a heart-warming concept and I liked the Thesis for making a stand (like the Rover 75 and Citroen C6) for an alternative, more comfort orientated and luxurious approach to the upper sectors of the mainstream.